Rangers Football Club hosted the UK Asian Football Championships Final at Ibrox Stadium on the weekend of 2nd-3rd September 2017. The tournament featured eight teams from all over the UK, including a team representing the Scottish Ethnic Minority Sports Association (SEMSA) and a team from the Queen’s Gurkha Signals. 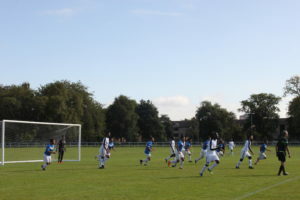 Preliminary games were played at Glasgow Green Football Centre with the Final being taking place at Ibrox on Sunday, 3rd September. Rangers Managing Director Stewart Robertson said: “Rangers Football Club is delighted to once again host the UK Asian Football Championships Final at Ibrox. This event truly demonstrates the universal appeal of football and the power it has to bring people together from different cultures and backgrounds. Dilawer Singh, President of SEMSA commented: “It is quite remarkable that we celebrate the 19th consecutive championships, however it remains a source of great sadness that we have yet to witness an Asian player playing at the highest level. From football perspectives, the UKAFC is the equivalent of Champions League of Asian Football League as only winners from currently recognised County League are invited/selected to take part. All these clubs regard this championship very highly (FA Cup/Nepal Cup) and as such their preparation and commitment are second to none. Apparently, these clubs have their own club grounds, coach and management team and even go as far as buying players from League 2 Club as some of them joined after their part in weekend’s FA Cup game. QGS lost their games 3 – 0, 3 – 0 and 6 – 1 but gave their bestand really enjoted the experience and are looking forward to hopefully competing again next year. The team said; “In all honesty, we travelled up north with just a ‘dim hope’ but we have returned back home with more hope and optimism, pride and confidence but above all with an impetus to work harder to address our weaknesses so that we can improve as individuals and collectively as a team; Nepal Cup 2018 still remains our top priority”. A signed football presented to the team by the Vice President in respect of our contributions towards fair play and a VIP treatment during Ibrox visit; watching from director’s box, a guided tour for free, lunch with VIPs etc and amount of praises and drinks that came pouring our way during the Dinner Night are without a shadow of doubt are an indications that we justified our presence in true Gurkha way. 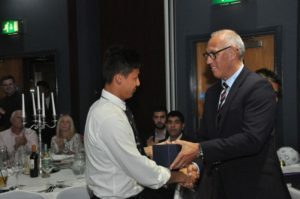 Now in its 19th year, this event was established to promote football for all and to showcase the increasing level of footballing talent within the Asian community.